Wednesday the 26th of until the 28th of December 2017. 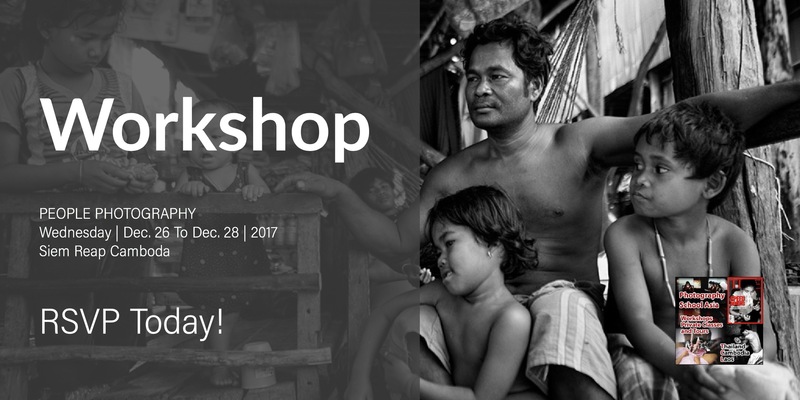 This workshop is limited to five students only, we will visit the temples of Angkor Wat, Tonle Sap Lake & rural villages in Siem Reap Province. The lessons is open to all levels of photographers and will teach how to take good portraiture on location. You will get to explore some of my favourite places in Cambodia with me and our driver Voan as expert guides. Each morning starts with me given the day’s study targets, you get a hand-out and I use slideshows to help illustrate the lesson. My tours and classes are as learning orientated as you need, I know that each student wants different things from the tour. If needed everyone gets lots of personal study time with me too. Creating the perfect blend of tour and workshop. The fees are $500 USD per person, this includes transportation via boat and limousine, entrance fees to the Angkor Wat temple complex, entrance fees to the Tonle Sap Lake area. Accommodation is not included but we can assist with getting you a hotel booking. You will be picked up and dropped off at you hotels each day. One of the places we will be visiting the beautiful Tonle Sap Lake and surrounding fishing villages below is a small VDO of my student Pop’s day there.